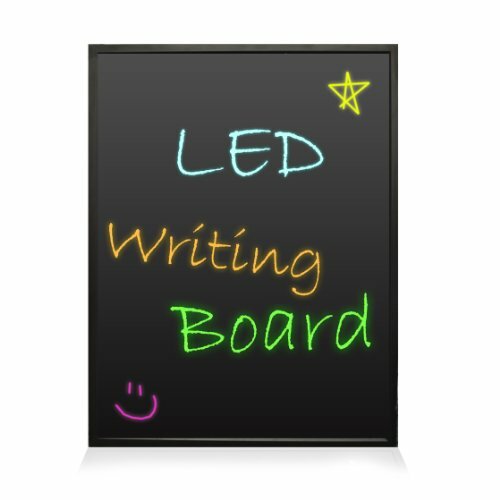 The Pyle LED Writing Board allows you to easily make your own neon signs. Put your artwork on display with LED flashing lights and fun fluorescent colors. Simply write your desired message or draw a picture and light it up for the full neon effect. Comes with 8 different fluorescent colored markers so it's easy and fun to use; It's like drawing on paper. Electronic control box with remote control allows you to wirelessly change the multi-colored lights and flashing patterns. Hang it up or lay it against the wall and show everyone your masterpiece. Fun for all ages and can be used anywhere - allow your kids to get creative at home or makes for a fun message board at the office. (Model: PLWB3040).